iderdider....: the princess and the poultry. Claire informed me weeks ago that she was going to be a pink princess for Halloween this year. Friday I informed Everett that he was going to be an angry chicken. I've always loved a good angry chicken. Haaaaa haaaa haaaa! I love me some angry chicken! Awesome, and the pink princess is very pink & very princess-y. :) They are both adorable! That is so sute. At Winco they have an angry chicken pinata. 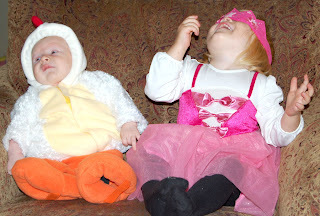 When the kids misbehave, I tell them I'm getting the angry chicken for their next birthday! 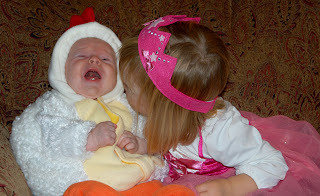 Your angry chicken is much cuter and your princess is very pretty in pink! i was hoping the chicken would make future appearances. yaye chicken!